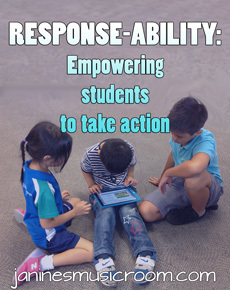 Response-ability: I was introduced to this term in a workshop with Cathryn Berger Kaye, a former teacher who focuses on service learning, and it has really stuck with me. Instead of “responsibility” we think about “response-ability”: Anyone has the power to respond to the issues in the world, to address and solve problems. Maybe we can’t change everything overnight, but we ALL have the ability to do SOMETHING. I really like this way of thinking: empowering students to take action rather than burdening them with a job. Children want to do good, and they want to make a difference. Responsibility can sound like something big and overwhelming. Instead, we can focus on the things we can already do right now to make the world a better place. How do you integrate a service mindset in your students?